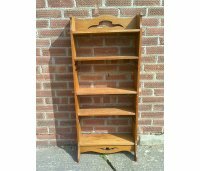 A Liberty and Co Arts and Crafts oak folding magazine rack of Angular form with bookshelf to the base and stylised brass handle . Height 39 1/2", Width 41", Depth 19 1/4". Circa 1900. 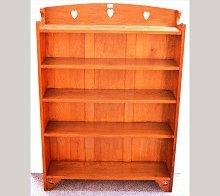 A Liberty and Co Arts and Crafts oak adjustable bookcase the upper drawer with ring pull handles. Height 44", Width 32", Depth 14". Circa 1900. 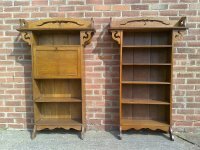 A good pair of oak Arts and Crafts bookcases. The flaring cornice with shaped supports, two leaded glazed doors with adjustable shelves behind, with a single heart cut-out above a lower open bookshelf, with extended open display shelves to each side with elongated supports uniting the cornice and shaped supports below. I have purchased these at different times, both have identical copper handles, one has hinges and one doesn't and never did have, you could choose with or without hinges as you could choose mahogany or oak, they are both original to the day they were made :) and I will sell singularly or as a pair. 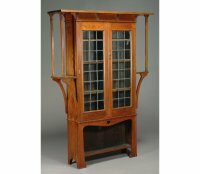 A quality oak Arts and Crafts bookcase by Liberty and Co with twin leaded glazed doors with Voysey style leaf and stem details, flanked by two side display areas with twin architectural sculptured supports united to the flaring cornice. A pair of drawers with stylised copper handles and an open shaped display area to the base. 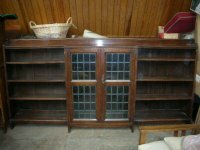 An Arts and Crafts oak bookcase by Liberty and Co, with shaped details to the top display area, leaded glass door and three open bookshelves below with it's original Liberty label to the back. Height 52" Width 20", Depth 13". Circa 1900. A Liberty and Co oak plate and cup rack with sweeping side details and elongated heart cut-outs. The upper shelf with a plate goove, the lower shelf with a plate goove and supporting pole with brass cup hooks underneath and Voysey style tree cut-outs below. Original label to the reverse. Height 25", Width 42", Depth 7". Circa 1900. A good quality Liberty and Co Arts and Crafts golden oak bookcase and matching Bureau bookcase with stylised floral cut-outs to the tops and shaped bottom skirts. Height 48", Width 21 1/2", Depth at feet 9 1/2". Circa 1900. 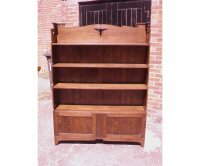 A quality Arts and Crafts oak bookcase by Liberty and Co, with three leaf cut-outs to the top shelf, a central lead glazed door with hand formed copper handle, flanked by further adjustable shelves. Circa 1895. Height 47", Length 72", Depth 10". 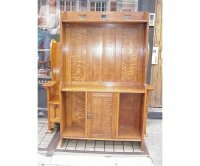 A Liberty and Co Arts and Crafts golden oak bookcase with unusual shelves that slide in from the back giving three different heights, with stylised floral cut-outs to the top and bottom and through pegged construction. Height 49", Width including pegged details 24", Depth at feet 9 1/2". Circa 1900. 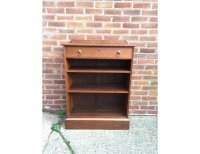 A neat litte Arts and Crafts oak bookcase by Liberty and Co with a domed top and extended display shelves to the top with shaped supports and three adjustable shelves below with extended stylised front feet for stability. Height 44", Width 27 1/2", Depth at feet 11 1/2". Circa 1900. 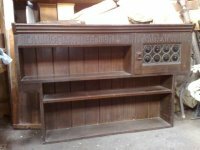 A Liberty and Co Arts and Crafts oak over mantle or hanging bookshelf, with Motto by Sir Francis Bacon :- 'READING MAKETH A FULL MAN'WRITING MAKETH AN EXACT MAN'. With a green bottle glass door to the upper right hand side and a long bookshelf to the left with a further adjustable shelf below. Height 39", Width 60", Depth 11". Circa 1890. An Arts and Crafts oak fire surround by Liberty and Co with flaring cornice and arched support with open shelf, a central mirror with shelf flanked by 2 cupboards with green glass and Bulls eye glass and the doors with iron ring pull handles. Four compartmented arched display areas with tapering legs and brass moulding to the fire opening. Original enamel label to the back. Height 90 1/2", Width of cornice 70 3/4", Depth of cornice 10 3/4", fire opening opening 39" x 34". Circa 1890. An almost identicle version is illustrated in the Pictorial Dictionary of British 19th Century Furniture Design on page 372. An Arts and Crafts oak settle by Liberty and Co the back with a Dutch couple and a cat on a mat warming themselves in front of the fire and a motto which reads : 'BE IT EVER SO HUMBLE THERE'S NO PLACE LIKE HOME' and a lift up seat for storage. Height 36", Width 32", Depth 16". Circa 1900. 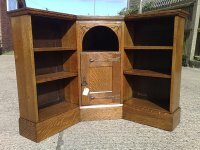 A superb quality Liberty and Co Arts and Crafts oak corner bookcase made from beautiful 1/4 sawn oak with arched opening to the top and carved half Trefoil details to the corners and a central cupboard below with superb quality stylised handle and conforming hinges flanked by 3 shelves to each side all on a plinth base. Height 36", Length down each back side from the corner to each end 39" each and it is 22" from the very corner to the front of the central recess, Depth of bookcase sides are 10" each. 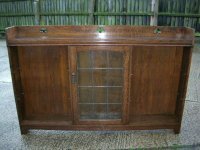 A quality Arts and Crafts 1/4 sawn oak breakfront bookcase by Liberty and Co, with subtle carved scrolls to each top end inside and out with a grove to the top shelf for displaying plates, a central lead glazed door with top quality stylised brass entwined handle, the ends cascading down. A Liberty and Co 1/4 sawn oak bookcase with Liberty's famous squashed heart. Height 69", Width 39 1/4", Depth 12". Circa 1895. A Liberty and Co Oak Bookcase. Height 65", Length 49", Depth 11". Circa 1895. 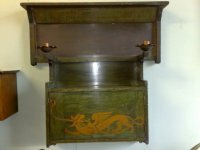 An Arts and Crafts wall cabinet retailed by Liberty and Co with gold stencilled Liberty Dragon and Motto ''LET THE TAPERS BURN UNWAVERLEY. Height 27 1/2", Width 27", Depth to edge of sconce 8 1/4". Circa 1900. 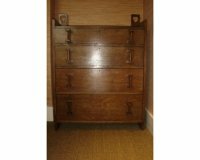 A very rare Liberty and Co Atheleston (1/4 sawn) oak chest of drawers with wonderful Heart cut-outs to the back uprights and 4 large graduating drawers. Height 46" Width 33", Depth 18". 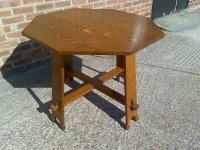 A Liberty and Co Octagonal centre table designed by Leonard Wyburd with through pegged construction a pure design classic with it's original ivorene label. Height 28", Width 36". Circa 1890. 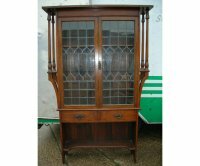 A good Arts and Crafts oak bookcase by Liberty and Co with stylised hearts to the top and to the base. Illustrated in Daryl Bennett's Liberty's Furniture, page 266. Height 51", Depth 9", Width 36". Circa 1900.